Janara is thirteen years of age turning fourteen in February 2018. She developed a love for drawing already prior to pre-school and works at present mostly in coloured pencil. Her favourite subject is by far drawing the portrait. But Janara is not only involved in drawing and painting, as she also plays the violin. Privately Janara loves spending time with her cat, Gandolf and playing computer games. Janara told us in an interview that she thinks very highly of her art teacher. She says: "Martina is so wise, especially when she talks about life lessons". The 2018 Scholarship is designated to Janara for her studious passion and persistence to overcome problems to achieve desired results. 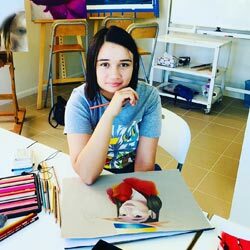 She places great effort to further her development in art and has attended various of our adult workshops in portrait, colour mixing, oil, drawing etc.